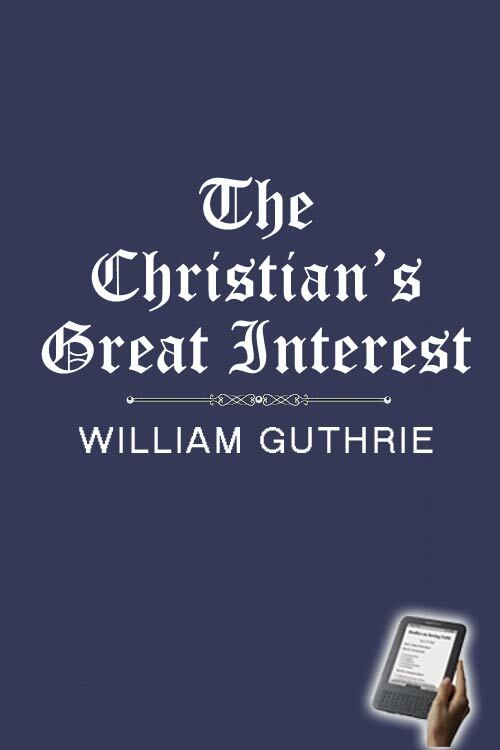 The word “interest” in the title of Guthrie’s book does not just mean that the book deals with the matter of greatest importance to a Christian. It also has a legal sense, in which to have an interest means to have a valid stake or share in something to our benefit. Guthrie’s book deals with how the Christian may know that he has a legally valid claim within the Will and Testament (or Covenant) that the Lord Jesus Christ graciously makes with His people. Guthrie helps us to put ourselves in a courtroom trial where we are under Scripture as a judge to determine whether or not our claim is a true one. How can someone know if they are in Christ and whether or not he may lay genuine claim to God’s favour and salvation? What should we do if we cannot find in ourselves the marks of a saving interest? 1. How can someone know whether or not they are truly saved? It is important to be clear that assurance is possible, and more easily attained than many realise. It is of the utmost importance to be “savingly in covenant with God”. Scripture must be the rule by which we are able to judge whether or not this is so. There is also a lazy apathy that resists the effort of examining ourselves, but it is “a work and business which cannot be done sleeping”. Assurance must be laboured after, it is not something that falls effortlessly into our laps. Guthrie speaks of the different ways in which people are drawn to Christ. Some indeed may be drawn lovingly or called suddenly in a very direct way. The “ordinary” way involves being humbled by conviction during which the conscience is awakened till the soul is full of concern about salvation and driven from resting in anything of themselves, to casting their all on Christ for salvation. This is carefully distinguished from the temporary convictions of those that fall away. The first evidence that Guthrie calls for in this trial is faith. Faith is vital in the matter of assurance – indeed all other marks are worthless without it. Yet it can be mistaken. It is not as difficult or mysterious as some men think. Scripture speaks of it as a simple trusting, resting, and looking. It can be found in various marks of submissive obedience and devotion to Christ. “If men but have an appetite, they have it; for they are blessed that hunger after righteousness”. Thus Guthrie identifies the marks of true faith, but also distinguishes it from false faith. The second set of evidence called upon relates to regeneration. There is a total renewal when a man comes to saving faith in Christ. In mind, heart and will he is changed from being self-oriented and self-serving to serving and glorifying God. Attitudes to all aspects of life are renewed, whether it is work or worship, or relationships, or recreation or eating and drinking. There is a respect to all of God’s commandments, and a submission to and valuing of Christ alone that hypocrites never have despite their outward similarities with believers. The great question in the minds of many, however, is why some believers doubt. Guthrie opens this up in considerable depth dealing with God’s sovereignty and our own responsibility in these matters. He speaks of twelve areas where different levels of experience may be enjoyed and where assurance may be obtained. 2. What should we do if we cannot find in ourselves the marks of a saving interest? Part Two of the book proceeds to deal with the second question raised: what should we do if we cannot find in ourselves the marks of a saving interest? Many may believe that they have closed in with Christ in the gospel. Very few, however, really have. What is it to close with God’s offer of salvation in the preached covenant? It means to recognise the full guilt of sin, our need of salvation, and the impossibility of any salvation without God’s appointment in Christ. We must “quit and renounce all thoughts of help or salvation by our own righteousness”. Faith is humble though resolute, and hearty rather than mere mental assent, though it must depend upon knowledge. Chapter I.--Things premised for the better understanding of the trial itself Before we speak directly to the question, we shall premise some things, to make way for the answer.